According to experts, this behavior affects 3% to 5% of the population, which could mean more than15 million people in the USA with these characteristics, or up to 1 in 20 people – higher percentages than one might realize. The Idealization-Devaluation-Discard Phase – 1) Praise/pedestal, 2) tear-down, 3) discard. Gaslighting – a technique abusers use to convince you that your perception of the abuse is inaccurate. During the devaluation and discard phases, the narcissist will often invalidate and criticize your emotions, and displace any blame of his or her abuse as your fault. Frequent use of phrases such as “You provoked me,” “You’re too sensitive,” “I never said that,” or “You’re taking things too seriously” after the narcissists’ abusive outbursts are common and are used to gaslight you into thinking that the abuse is indeed your fault or that it never even took place. Smear Campaigns – used to accomplish three things: 1) it depicts you as the abuser or unstable person and deflects your accusations of abuse; 2) it provokes you into responding, thus proving your instability to others when trying to argue his or her depiction of you; and 3) serves as a hoovering technique in which the narcissist seeks to pull you back into the trauma of the relationship as you struggle to reconcile the rumors about you with who you actually are by speaking out against the accusations. Best solution: NO CONTACT. Triangulation – In the book Psychopath Free by Peace, the method of triangulation is discussed as a popular way the narcissist maintains control over your emotions. Triangulation consists of bringing the presence of another person into the dynamic of the relationship, whether it be an ex-lover, a current mistress, a relative, or a complete stranger. The False Self and the True Self – The narcissist hides behind the armor of a “false self,” a construct of qualities and traits that he or she usually presents to the outside world to gain admiration and attention. Due to this armor, you are unlikely to comprehend the full extent of a narcissist’s inhumanity and lack of empathy until you are in the discard phase. Website: Five Sneaky Things Narcissists do to Take Advantage of You for the full information. “When dealing with malignant narcissists, psychopaths, sociopaths, borderlines, drama queens, stalkers and other emotional vampires, it’s commonly advised that no response is the best response to unwanted attention. This is often true and No Contact (the avoidance of all communication) should be used whenever possible. So, how do we escape this parasitical leech without triggering his vindictive rage? Gray Rock is primarily a way of encouraging a psychopath, a stalker or other emotionally unbalanced person, to lose interest in you. It differs from No Contact in that you don’t overtly try to avoid contact with these emotional vampires. Instead, you allow contact but only give boring, monotonous responses so that the parasite must go elsewhere for his supply of drama. Website: The Gray Rock method of dealing with psychopaths for the full article. MEDICAL CORNER …. What is a psychopath? NOTE: For ALL COMMENTS, click here and scroll the page. Submitted on 2015/04/11 at 4:58 pm | In reply to jacqueline. The people that she has connections are in the same boat that she is. Submitted on 2015/04/09 at 12:06 pm | In reply to Debra Salinas. Oh my gosh, Debra! I’m so sorry you suffered through your husband’s hateful sickness. I’m glad you left him and started a new life, a new adventure. I want you to know that you are not your experiences. That horrible situation and your ex-husband do not determine your True Worth, an Eternal Spirit, loved by God now and forever. You are a fabulous being and you are now at the stage of freedom where you must decide to make your own choices in order to create the life you desire. Never give that freedom of choice away! First, envision what you want as a desired result in your life, then work backwards to determine what choices you make (cause), to result in your chosen goal (effect). You can do this. And never, ever, give away your freedom to choose for yourself. That right is yours alone. Remember, you are loved and you are love. He stopped kicking me.and grabbed my l hair backward so I was looking at him. I swear I was looking at the gave of Satan. He was almost put oh breath when he.asked me if I was going to stop screaming. I nodded yes and and as soon as let go of my hair, I jumped up and ran out of the apartment. Every one who lives in the building was outside and told me 911 was on the way. I was hospitalized for over two months and after weeks in casts, both my arms had to be rebroken and plates and screws were used in both arms. That’s what holds my hands to.my arms. I stayed away from him for 14 months. He was indicted by the grand jury.who changed him with four felony counts. He found me a couple weeks before the trial and kept me from testifying. But that is a whole new story. He never apologized. He says I made the whole thing up in my head. He tries to get me to believe I fell. Six weeks ago, I escaped (again). This time it’s different.. I know who and what he is.. Sociopaths get their victims away friends and family and use brainwashing behavior so we can’t get away. I’m healing well. I filed for divorce and have a strict no contact order of protection.for a year. I moved to a different part of town and my address is strictly protected. Anyone who thinks they are being victimize. And under the control of a sociopath, get out NOW!!! I escaped with only two suitcases. I left my car and a house full if furniture. That was something I I didn’t want to ssh. He has everything. I don’t care about those things any more. He was found to kill me if I didn’t just run. Also, if you’re ever attacked,v dint cry for help, yell “Fire!” People will respond quick and fast cause fire invokes their safety. Tom Salinas is from Chicago. He lives in Tempe.Arizona. Getting caught up with him may cost your life. He is charming and romantic and cleans up well, I’m so happy to finally be free. II used to think the good times were and how loved and desired he mate me feel, the abuse was worth it. Not now. I wish I had escaped years ago. I lost so much. My marriage and all he made me believe was never real. . I was never a wife, I was only his victim. All lies and deceit. Submitted on 2015/03/30 at 3:15 pm | In reply to Andrea Harris. Submitted on 2015/03/30 at 1:29 pm | In reply to Gabriel. Submitted on 2015/03/30 at 1:12 pm | In reply to Ann. Thank you Ann for your valued help on this. I truly feel my heart go out to you, the pain I have in me from the last 7 years is hard to describe and it’s become just as difficult to get over. I am still haunted by him, he continually keeps emailing me, even without a response from me in the last months we have been apart, still trying to put me down, or taunt me that he will pay back the money he owes me, or saying things like “i bet you can’t stop thinking about me, i bet im on your mind every day, good or bad, you think of me hahaha” – God help us. I hope we never experience or have the misfortune of encountering others who are this way. It’s taken such a toll on my life and emotionally that 10 months later, i still am having a hard time to trust anyone or move on or even go out to enjoy life.. i’m still in a state of shock. I wish you well and after 30years i salute you for the way you have been able to move on with your life. God bless. Submitted on 2015/03/27 at 7:50 am | In reply to Debra. Please do NOT waver… do NOT go back. Seven years is long enough unlike myself who actually married such a man, had a family and lived a hell on earth for 30 years before HE found HIS soul mate and dumped me and the two children left at home telling them he had raised his family and now had a new one. Being in a business of our (excuse me HIS own) he was able to manipulate funds and such so we ended up with nearly nothing to live on, refused child support and threatened my safety should I seek it… of course there was no alimony He tricked me into signing a legal paper giving me almost nothing. Even divorced he continued to be a threat both to me and our two youngest sons and until I met my present husband was, IMO, a danger to all of us. Don’t regret the 7 years you lost. Be thankful you didn’t marry him and rejoice you have life left to start over. Submitted on 2015/03/12 at 10:00 pm | In reply to Chalie. Of course you realize that it is your choice whether or not you continue to date that person. What do you choose for the kind of life you want for yourself? Twelve years of my life. I don’t know what happened, how or why. I’m not a stupid person. I don’t feel gratitude for knowing now, for knowing better. I want to go back in time to when I didn’t know. This is not me, I’m naturally curious. I have an analytical mind, I love to learn. But I don’t want to know this. I don’t want to face all I have lost. I find myself completely broken by this person, physically, mentally, emotionally. I’m in chronic and constant physical pain and am deeply depressed and suicidal. I have no friends or family, even my dog has been taken. No job or money or car. I am wholly defeated. And yet, I still love him. Though my head knows better, my heart doesn’t. I’m so confused. I don’t know how to recover from this. I pray all the time, every breath is a whispered prayer for help, comfort, strength, guidance. I’m so lost, I don’t even know what questions to ask. I just need help. Please. I don’t want to die but I don’t know how to live in these conditions, with this pain, with the reality of what I’ve suffered. They are gone but still in my head, counseling me to give up; in my pain, pinching and stabbing me, reminding me that this is what I deserve; in the bags beneath my eyes and the creases around my mouth. Undeniable denial. 1) You say this is what you deserve. How could anyone DESERVE what you are living? Please explain what you mean. 2) What do you want for yourself? Go beyond the superficial wants to your REAL wants. This might take time to answer. But until you know what you want for yourself, you won’t make the right choices to help you get there. You’ll keep making bad choices that end in bad results. Do you want to change that? 3) You say you still love him. What do you love about him? 4) THIS IS CRUCIAL! Do you love yourself? If not, be completely honest, because if not, and it seems from what you say that you don’t, then with your willingness to change, we can work on your feelings of self worth. 5) You are not broken. You might feel broken, but the real, wonderful, strong, wise you is still inside you in connection with your Higher Power that has all of the answers. Your experiences do NOT define who you are. Your experiences are life-lessons. What life lessons do you feel you have learned from all of the last 12 years? Do you really choose (and it is your choice), to live the next 12 years in the same, painful, degrading drama? To what purpose? Would you like your life to improve? IT IS DEFINITELY POSSIBLE. BUT YOU HAVE TO WANT IT! 6) No, you are not a stupid person, but you must WANT to make better choices. Until you choose, with determination through self-love to follow through on those choices, your life will only get worse. THAT IS ONLY IF YOU CHOOSE TO ALLOW THINGS TO CONTINUE AS THEY ARE! I’m sure you are feeling lost, desperate and alone, but you are not. For ONE, you are ONE with your Source, God, Higher Power, Divine Wisdom, Pure Intelligence, Unlimited Supplier (that supplies all of your needs, not a human!) You have access to this Power of the Universe 24/7. All you have to do is go within and ask for help from that Power. One of the strongest prayers is ‘help me!’. Then listen for answers and guidance. It comes. It always comes. Maybe not in the way you envision, but in a better way. Connecting with that Inner Power empowers you. And once you start feeling your own empowerment, the crushing feelings of depressions and suicide will evaporate. For TWO, research what is available in your area where you can go for help where you can start getting back on your own two feet and start becoming independent of that debilitating control that is crushing you. It will be a safe place for those who are abused, or a church, or… There is one there for you. Check it out. For THREE, you must walk away. If you stay you are part of the problem. You are a co-dependent with the abuser. You are not a victim. You have the power to change your life. But if you choose to stay, then answer another question – WHY? What benefits you by staying? What do you lose by staying? Your quality of life is the big one you lose, and personally, I don’t see any benefits to your staying. If so, what are they? Lauren, you can do this. I will help you. Jess will probably help you, and he is a reformed Narcissistic Sociopath – a rare happening – so he will have excellent advise for you. Listen to him. You are not to do this alone. Go to your Inner Power, and I am here for you too. In answer to your questions: I feel that this is merited because I feel responsible for what I’m going through. Like, I was recruited to participate in my own demise, if that makes sense. I feel guilty and ashamed that I’ve been living like this for so long, unable to see what was happening. I think there was a willingness on my part to give up my power, piece by piece. I relented to his demands and gave up my friends, family, job, etc. I thought I was being taken care of and as I became more reliant on him, he became my center, my priority. I want healing, freedom, peace in my life. I feel so shattered. Like he has taken root in my mind. He is gone but I am not free of the abuse. I am so conflicted about the love I feel because I wonder if the person I love really existed. I love the attention, the conversations, the humor, just spending time together. He broke up with me and kicked me out after I started seeing a therapist. That was 5, almost 6, months ago and I’ve been so heartbroken. Telling myself, it’s better to have loved and lost, etc. It’s taken that long for me to even acknowledge the truth of the situation and I’m devastated, thinking he never even loved me but just used me all those years. It’s as if I have selective memories and some few key moments have surfaced. I wish I could say I love myself but I’m fairly sure I don’t. I abandoned myself in deference to him and his needs. There are other issues at play. I’m highly sensitive and tend to internalize things. I’ve been deeply hurt by most of the people I’ve loved and trusted. It’s hard to think of it in any other way than to say I must be a magnet for this kind of treatment, these kinds of people. In that way, I feel I deserve this. Lessons…I’m really trying to be optimistic with this one. Not to abandon myself or anyone else for the sake of any one person. Any other lesson that comes to mind is not so hopeful. Such as, never trust another human being, not even yourself. Love is only a means of controlling other people. I believe in God, that He loves me; but I suspect every person I meet, wondering what, given the chance, they might try to do to me. I do want to make better choices for myself. I want a better life. It feels like, as a result of this, my world just gets smaller. I’m hardened by this. I want friends but I’m scared of being manipulated yet again. I think no one can be trusted; or, rather, people can only be trusted to be selfish and self-serving. Thanks for reading and for such a prompt response. I appreciate the kindness. Truth’s Responses to Anonymous L’s answers. •	Guilt and shame: I understand your feeling guilt and shame but you can start working on forgiving yourself for your choices up to now. You chose what you believed was right at the time. If you were in that same mental place now as you were then, you would probably make the same choices again. But you are not in the same place. You are in the beginnings of shifting your life into something far better and happier – more healed. What you will eventually realize is that, despite the ugliness of what you have been through, there is always a gift within, a pearl, a treasure that in some way benefits you. For example, those experiences made you stronger, wiser, encouraging you to turn to God for all of your answers and guidance. Those experiences contributed to your behaviors and thoughts today. But, you have a Great Power at your disposal, an empowerment, that, with your permission and allowance, will take all of those past experiences and turn your ‘now’ and your ‘future’ into something more wonderful than if it had never happened. This is probably a difficult concept for you because of where you are at this time, but it is the Truth for you. It takes letting go and letting God. Have faith and trust. •	What you want – healing, freedom, peace in your life. Everything you want is already yours to claim. You are already in the beginning stages of each of those. Now that you know what you want, start at each of those goals, and then work backwards. What choices might you make that will get you where you want to be? I think you know that in order to have what you want, you must change where you are. If you don’t like the results of your choices, then make better choices that will lead you to your goals. Every thought, every word, every action is a choice. The secret is to choose well. The most powerful choices will come in collaboration with God, Pure Intelligence, where you choose from what is perfect for you and there are no wrong answers. No guessing. No hoping and wishing. Straight to the Source. God is the Source of your Freedom. •	Whom did you love? An illusion. He was a facade, no depth, only pretense. He said and acted in a way to get you to do what he wanted – controlling you. That person you loved never existed. BUT, there will be a person out there for you who DOES exist. First, though, you must heal from within, with the guidance of the Great Healer, before you should consider getting into a new relationship. If not, you will go back to the same personality over and over. First heal YOU. When you do that you will become stronger, happier, more confident, and you will never again allow anyone else to try to take your freedom and your life away from you. You will make wiser choices. By the way, you didn’t love and lose. You loved and won. You won because you are a good person and you CAN love, you CAN FEEL – something your former abusive partner could not do. You are the one blessed. •	You are fortunate he walked away: Now you can rebuild your life without having to consider him or ever again argue with him. You are NOW free – free to choose. Yes, this might be a frightening transition for you, but you are not alone. The Greatest Power in the Universe is within you, loving you, guiding you. •	FEAR and LOVE: Reread your message. How much of your choices were fear-based? Fear-based decisions will never lead you where you want to be – the reverse, in fact. What is the opposite of fear? Love. You said that love is a way of controlling people. Sorry, but that is false. People control through fear, not love – whether individuals, advertising or government. See it for what it is and reject that fear-based control. Love is not controlling. Start with your very next choice and ask if it is fear-based or love-based? Fear-based will be discouraging you, pulling you back into the false illusion of safety. Love-based decisions will be encouraging you, inspiring you, leading you to expand your heart and life beyond that false illusion of safety that is really a prison preventing you from your true bliss. Love-based decisions lead to happiness and joy. Learn to tell the difference. Once you do that, you will be reclaiming your power. •	YOU are only dependent on the Ultimate Supplier – not on a human. You are not a victim unless you choose to be. A choice. Choose strength. Choose wisdom. Choose love – for yourself most of all. That is where your healing begins. No one is doing anything to you. You are doing it to yourself through your choices. You make the final decision. Choose well. Choose wisely. I am here for you. I know in my heart that you are already on the road to healing. I know it, without doubt. Soon you will feel it too, but it might come in baby steps. Start journaling your days and you’ll begin to see your positive changes. A final comment: God tells me that you are loved, unconditionally with without judgment – just as you are. Learn to love yourself like God loves you. God tells me that you are never alone. Separation from God is an illusion – a lie. You are always connected to your Creator. Open your mind and heart to that continual connection. ALL things are possible with God. L, That is the way the world is unfortunately, some people want to watch it burn, others want to see the best, its up to you to pick which one you want to see, im not claiming that ive been the best person as if you read the blog about me 5 months ago it shows how bad it can get, the only thing you can control is taking care of your self 1 day at a time, you are going to fall in love again, and no matter how hard you run from it.. it will happen, all we want to offer you here is the chance to see what kind of behavior you need to watch for so you can protect your self when it happens. I’m not out of the woods just yet. Though he broke it off with me, he calls sometimes, late at night. Talks about other women mostly. I suppose I should just cut contact completely. The phone is a landline with no caller ID. He still gets some of my mail, has some of my stuff, including my dog. The worst part is how mentally twisted I feel, like he is a fixture in my mind, telling me things I think I need to hear…but I’m not so sure. I appreciate this page and the advice and all. I’m just full of doubt, like pathological doubt. I knew, I saw; each time I offered the benefit of the doubt, rationalizing, one way or another, on his behalf. I held that knowledge so close, it was our secret. And now, in spite of what I know, I still have doubts. I fear that I’ve been complicit. Like I’m infected by him in some way. And the question you mentioned is posed in my mind: what should I do now? Choose love or fear? To use or be used? I know that my scope is limited. I can’t see beyond this pain. I don’t want to hurt others as he has hurt me but I don’t want to be hurt like this again. Sorry, I’m lacking focus and direction. I’m in a mood. I’m sure I have questions I just can’t find the words just now. Thank you. Be patient. Awareness of your situation, the truth of it, is a huge step in a healthier life direction. The best option for you is to cut off all contact with him. Walk away and live as if he doesn’t exist – at least not in your life. Does he know where you live? Some suggestions and questions: You might get a phone with caller ID. You might get an answering machine and let all calls go to messages, then return the ones you choose. The mail: Make sure you change your address of all of your important mail to the address where you are now, OR, to a PO Box. Does he have anything important of yours, other than the dog? Things you can merely walk away from? After all, they are only ‘things’. Things can be replaced and cannot compare to your health and happiness. You come first. If you don’t have to worry about the dog at this point, then you can totally cut the connection. As to the dog, do you want it back? Can you ask him for it, or make up some excuse to get it – like to take it to the vet or get it’s shots, or something? Then not return it? Again, does he know where you live? You made a comment of ‘to use or be used’. Neither one is the correct choice. You don’t use, or allow yourself to be used. Both of those are fear-choices. I realize you are full of doubt. Change itself can be fearful – moving into the unknown. That’s where Divine Guidance, truth and faith are crucial. Divine Guidance has all of the perfect answers for you. All you have to do is ask. So simple. Don’t allow ego to convince you otherwise. Your choices are not limited. BUT your first choice, your priority, is YOU. YOU are the only one over whom you have control. YOU are the one who makes the choices that determines your life. Your choices brought you to where you are now. For a better life, make better choices. You say you lack focus, so Focus on YOU. That is your ONLY focus right now. You are what matters. Start a list of what you want for your life – you said peace, harmony, and love. Choose those. Hoping won’t get you there. The right thoughts, the right choices, the right actions will get you there. Be strong. You are not alone. Start calling on the Power of the Universe to fill you with that Power, that Pure Intelligence, that will lead you to the best life for you. Choose love for you. He will not provide that for you, ever. Only you can choose that for you. Your Unlimited Supplier, the Great Love, supplies all of your needs – not a human. Do not be dependent on anyone or anything outside of yourself. You can do this. You have a strength you don’t yet realize you have, but it is already inside you. Call on that strength. Allow it to pour into you. Use it. That is what that Power is for. For YOU. To help you focus, to get you started, start and end your day with meditation and/or prayer. You will get to the point where you pray constantly in that you turn everything over to your Higher Power. Don’t give up. The rest of your life starts at this moment. Choose wisely. Choose YOU. Hes going to use other women to try and make you feel bad, the truth of that is, hes lieing about them, most likely hes made them up, the entire situation just to make you feel bad, hes going to make the other girls seem perfect, and they will not have any of the “flaws” he made you think that you had. The truth is you made the right decision and hes trying to drag you down for it. Thank you for this. He’s been calling lately and it’s felt like much of what he says is trying to gauge my reactions and pull me back in. If he’s not talking about other women, he’s saying how depressed he is, even threatening to hurt himself. It’s like, I see what he’s doing but I can’t stop myself from caring. He asks for my help, I offer advice and empathy, then he rejects me again. It’s dizzying and infuriating. A question for you, Jess, is about the types of people you were with. Did you choose people you perceived as weak? Or did they have particular strengths? Did they have any common traits? I’m asking because, I know I have a lot of work to do on myself, my self-esteem, self-love, confidence, trust. I can’t shake the feeling that I may have been broadcasting aspects of myself that were attractive to this type of person. He’s not the first. I’d like for him to be the last. Another question, about your recovery. I read about it and you said that you found yourself in a unique position wherein you were able to see things from a fresh perspective. I don’t guess those conditions could be reproduced for another person. It seems like this kind of work, picking up behavioral patterns and facing harsh truths, takes a lot of commitment and motivation. Where does that come from for you? What drives you to want to get-and stay-better? Another still, sorry. And I know you don’t speak for all. Did you struggle with disturbing thoughts? Did you share them? Or am I in the wrong line of questioning? Perhaps I should be asking instead if his threats of self harm are even legit or is it just another way of manipulating me? At first i looked for people that were co-dependant because they were the easiest to control, but as i gained a better understanding of people i understood what drove people and i could pick apart pretty much anyone using a persons natural guilt reflex, everyone with this disorder has their own agenda, he might simply be after you for your looks, could be because you are the friend with someone, it is possible it has nothing to do with who you are or anything you project. Ill be honest the easiest girls for me were ones just coming off of a broken relationship, especially those where women felt neglected, which does cause by default some co-dependancy because it causes a need to feel desired again. In your case i think you may get drawn to this type because they will project alot of confidence and charm and they will quickly if not almost force that they will never neglect you. I had to face the fact that i was a bad person, i had to look at some of the darkest things ive done, examine those things, and the 1 answer i can look back at is the thought that i had. “How could anyone be ok with the things ive done to another person.” I just want to be a better person, for my self, i think what allows me to continue with my change is that fact, i dont care what anyone else thinks of my change, im doing it so that i can look at my self in 10 years and say i honestly gave it my best shot, and i was the best person that i could be under my own power, and thats my goal, to be a better person to my self, and by default everyone around me will see a better person to be around. You honestly dont want to know the kind of thoughts i had, they are most likely things that you would never consider. However, that said, he will never hurt him self, he will use it to make you feel guilty, he thinks WAY to highly of him self to hurt him self, everyone with the disorder does, they are way to important in their own mind to give it up by ending up in the hospital under their own power. Hes playing your natural guilt reflex, and no offense intended this is just my observation, you are biting on it like i made many many women do. I have noticed on this site you only speak of narcissistic sociopath being in a romantic relationships. Like narcissistic sociopaths do not target family and friends, they do. 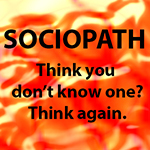 I have a narcissistic sociopath in my family. They have all the traits listed above. I think is worst when its a family member and causes so much more harm and devastation. When it is a spouse or someone your dating you can get rid of that person out of your life and never have to deal with them again. When it is a family member and other family members are still under the veil and refuse to see them as they are, you are really lost and on your own. You make an excellent point. There is a different kind of love involved with family than in one who believes they are loved by a person whom they later discover is cursed with a damaging personality. The most painful are the ones with children at risk. There are some posts on here from mothers and family, sometimes about a mother, or a father, or sister or brother or uncle, etc., but mainly posts from disillusioned partners. However, no matter the kind of relationship, it still hurts, it is still confusing, it is still difficult to walk away. With family it is challenging when you meet together for family gatherings, especially if you live in the same area. Even more so when you recognize the problem, but others in your family are blinded to the truth, or fearful to accept the truth. I don’t know the relationship and situation, but how do you handle it? Much reaction to the challenge depends on the severity of the personality. A suggestion might be for you to be nonreactive when in their presence and therefore in control of yourself. Loving yourself. Only behaving with positive energy so that you aren’t caught in the negativity, that you aren’t triggered. This personality is excellent about knowing how to trigger different people in different ways. That is how they control. For you to refuse to react, and to not allow yourself to be triggered, helps breaks the cycle. Of course, your greatest power is to turn it all over to the Inner Higher Power, that Pure Intelligence that has the answers to all of the problems, and to trust and depend on that Power. The answers will come. Your intuition is your Divine Guidance in communication with you. Listen, allow, have faith. At some point you might even hand the family member a note with the http://www.truthlover5.com site on it. Not to say what it is about, but mentioning that they might be interested in checking it out. I don’t know if the person is dangerous. If so, that must be taken seriously as to what is best for you. You are the only one over whom you have control. You can be the example for others through your right choices and actions, without proselytizing. The secret is to remain non-confrontational and maintain your own control, with a positive self-love attitude and in continual connection with the Great Power. Again, I don’t know your particular situation, but you still might have the choice to walk away and go do something else that is healing for you – a walk, a swim – something you truly enjoy. Please let me know how it is going for you. I care. I have just left a five year relationship for reasons I haven’t understood till recently. Now I know he is narcissistic (sociopath/psychopath). All the things I’ve been reading describe him to T.
He has yet to call me In four weeks since I left. Everything is thru text and each session ends with him turning it all around on me. I havr found out that the entire thing has been inr giant lie. Now of course people are telling me everything. He has lied about his past what hr has done even people that he says he knows. Its to the point that I dont know if I can evem believe his name. And the worst is that hr has not acknowledged what he has done in any sincere way nor apologized for any of it in a manner that I can believe. He tore my soul apart killed my trust and wants to blame everyone around him but takes no liability. He begs me to come back and In the next breath tells me I have to answer for leaving and talking to friends. He can turn evil in an instant(and when I say “evil” I mean you can see the devil himself: hes had me cowering in corners at times while hes berated me for disagreeing with him). He has lied and used his daughter ti further his agenda with others so he still looks like Mr.Perfect and I have become the ‘Crazy Ex’. He has donr this with previous relationships that I’ve just found out about. .This has caused me to become stricken to the point that I cry all the time I question my selfworth and I think I would go back but I know he would eventually kill me. Every article I have read in the last three weeks tells me to move on but how do you move on when you have been mentally abused into thinking that there is no one else that will love you. ?.How do I get over what hes done when I cant get an apology or even an acknowledgement from him?.He truly beleive s that hes the victim here and there is no remorse for him basically taking away five years of my life. You do what is right for you! You choose what will free you from your toxic situation. Don’t wait for him to make any kind of move before you start healing. He will never apologize to you. He will never acknowledge you. That is not part of his damaging personality. Don’t expect it. No matter how difficult a challenge, do not go back to him. Do not contact him again. You say ‘ex-wife’, so that means the most difficult part is behind you for you to more easily walk away. You also mention ‘his daughter’, which tells me the child is not of your blood, although you still might feel an affection for her. I’ll mention the child again later in this comment. KNOW THIS! You are not alone. The Divine is with and within you always. That Inner Connection is where your guidance, healing and power lies. The Power of the Universe is within you and is continuously available to you if you will ask, give permission, and accept it. Think of it as a Divine Partnership with you. There is no greater power. Your Opportunity: The positive direction for you and your life starts now, this moment, and goes forward. You now realize who the man is whom you allowed to control you for five years. You now realize that YOU are not the problem. You now have the freedom to walk away and build your life into the magnificent life awaiting you. To the contrary, he is stuck with his horrid thoughts and actions 24/7 – unless he miraculously chooses to change. No one can make that change for him but him. He is the one imprisoned. You may choose freedom. Choose it! Your self-worth: Do you grasp how fortunate you are that you have the choice to free yourself and heal? Many, many women – and also men – don’t yet have that opportunity, including your ex, unless he chooses otherwise. Latch on to to that chance and change your life. Let me tell you about your self-worth and how fabulous you are. You are created by the Divine, the Great Heart, the Pure Intelligence, out of the exact same ingredients as your Source. You are created from love, from light. That is what you are. With Divine help, your self-worth is where you need to focus everything you have in order to heal yourself. Focus on this one thing. Get to a safe place, cut off all contact, and heal. Realize your magnificence. As to the child, I don’t know her age or where her birth mother is, but if she stays with him, she is in danger or a destroyed life. Is there someone who is in a position to help her? Consider the last five years as a challenging and difficult life lesson. Let it strengthen you. Let it be the inspiration to choose a better way for you and your life – a joy-filled life. Everything you do is a choice – every thought, every word, every action. Choose well. Choose from within Pure Intelligence that is your true power – your Unlimited Supplier, not a human. Thank you. I have been dealing with this issue with my brother for decades. He was just released from federal prison and even denied he was in prison and denied he was convicted. Unbelievable! His destructive nature is amazing almost to the point of impressive if you you remove the the human destruction he has caused. How difficult for you and for those around him. As you know, you can’t ‘fix’ him. The only one you really have control over is you – being strong in connection with your Inner Strength. And to be smart. Practice self-love and do what is right for you. You can pray for him, but he is the one who must choose to change, which, from what you describe, is beyond his capacity at this moment in time. So, take care of yourself. The same for your loved ones connected with him. Truthlover5 I love you, and this article, It is amazing. I recently had contact with a narcissistic sociopath and needless to say I am so grateful for ending up here. It has done alot of healing especially as I have begun to see her again (she . People like that don’t know what they’re doing and it’s so nice to see that it was her fault not mine. Not to blame myself for everything and to actually ascribe blame to where it is due to her own personality and way of being. This has been such a blessing, and I thank God for you truthlover5. Thank you so much. Her coming back, if I’m honest, gave me a lot of hurt, and anxiety and also fear wherever I went because of the feelings of powerlessness and never being good enough that was in the relationship. The fake “friendship”, how everyone kind of “loved” her because of her “joy”. But she hurt me and … didn’t even seem to register it. And I kept thinking I was the one with the problem. 😦 Focusing on the perpetrator and their characteristics has really brought this to light and to life. Because without a basis of reality we are all lost sheep in the wilderness. BUt now I have this tool I can refer back to it whenever I feel slighted by a narcisstic person in my life – only 1 – and gain the strength I need from it. YOU Have been my empowerment truthlover5, more so than any narcissist ever will or dream of being. I love how you replied with such love and respect to the narcissistic person(s) on this page. I feel they need it, but their blatant disregard for human relationship and love – and true companionship – the essential neglect of another person’s NORMAL human rights which about everyone knows – except for these narcissists, is frankly super upsetting to me. I thought everyone was lovely, I never thought .. but I did. and It hurt me so bad. To say that a narcissist doesn’t have the potential to hurt someone they love is unloving and unkind – and most of all untruthful – I have gone so far with this narcissist in terms of loving her and trying to put her in the best light – but everytime she comes back or I am in her presence again – it feels like she is the queen bee and I am the lowly subject. Which is how it is with everyone around her. We’d like to think she’s just that great but the honest to God truth is secretly, inside, we all hate her. (not literally, but the fact that all we feel like disempowerment around her, yet no one could pinpoint it – they’re lack of knowledge prevented them from doing so) – says alot about the fact that narcissists are truly people who just want to be loved. and the secret weapon of narcissits and how they wield it – but also how lost and traumatised they themselves must be. I can only have empathy for them, and awareness of their deeply disturbing truth. Also, as I see you’re a Christian and a believer of Christ – to which I also ascribe the same glory and honour and name in all truth and being – I can say that I prayed super hard and landed up here. But I did, and all thanks to God, I realised this one truth: Why should I have to change myself for anyone? (FOr a narcissist that is – this was before I realised what she was and what she was trying to do – everyday was sooo trying because I would have to actually gird myself up to prepare for her onslaught of questions – her behaviour and dominance in conversation – so it took a lot of mental power at times to be with and around her – as she would always pinpoint me and come flying in my direction to exploit my weakness in the classic charming and superficial way, which I always was not comfortable with but was forced to feign okayness and happiness around her like she did to everyone else, because I trusted her … and thought she was something to be .. I realise now, was for her superficial gain.) I was in a dilemma – I was so upset, struggling and hating myself, and hating everything – but I didn’t know how to deal with it – with this person and how they made me feel. I don’t know how or why. and I landed up here. I just want to say that is has been an ABSOLUTE blessing! An absolute blessing to be here today. And I didn’t even know you were a Christian when I benefitted from this site. I just want to say thank you. THANK YOU so much. and you’ll never know how amazing it was, and how grateful I felt to both you and God, to think that one day he would use you to get to me in my suffering is amazing. The God that we serve. In Jesus name, let him be praised forevermore. And all things, ALL THINGS, subjected to under his feet. Including sociopathic narcissists and many others. Amen. I’m so glad for you that you were guided to this site and that the information has been healing for you. I was also Divinely guided – guided to offer this blog site because I, too, was confused and hurt by this unexpected type of personality. I’m glad that it has helped others while also helping to heal me. I’m proud of you for your great attitude. You’ve not allowed hatred to fill you, which is often the result with these type of personality traits. Anger and hatred, if not released, only harm the one feeling those emotions, not the one against whom the anger is targeted. Forgiveness is CRUCIAL to healing, especially self-forgiveness, which is often the most difficult to accomplish. Also, gratitude – gratitude that you can choose to be and live the truth of who you really are – God’s love in action – no matter the other behaviors going on around you. How they respond to your being love in all circumstances is their choice and not your responsibility. Your responsibility is to embody love at all times, which from your comments, is exactly what you are doing. Good for you! And thank you for sharing. Your sharing will help heal others, too.